Rumoured graft and bribery in Township business should have left a certain municipal official wealthy, and an ideal target for murder. So why was he dead and broke? 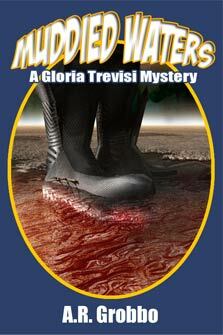 Newspaper editor Gloria Trevisi must find out, before one of her houseguests is arrested... or killed. The Plattsford Sun has all the news that's fit to print... and more. "Stories within stories fill this mystery with an unpredictable and gripping fascination that never lags." “I believe you were taking photographs from a low-flying aircraft over the field where the victim was found?” Inspector Gray queried. “And I believe that once again you have photographs of the scene? Taken from the aircraft shortly before the arrival of the police?” he asked, cutting her off. “Then I believe you’d be better off talking with Constable Sheila Miller. She was keeping tabs on him last night.” Gloria couldn’t help the slight twitch in her upper lip. “Thank you. That will be all.” The inspector’s face gave nothing away as he gestured toward the door. Gloria walked out without a backward glance. A courtesy print, and the loan of the negatives to the police, in exchange for nothing; no doubt they had more photos of the scene than she did. And more-than-average curiosity about Eric; why? What was interesting, or unusual, about an incredibly handsome, internationally-known operatic baritone, who drove a sixties muscle car, visiting her while her husband was away? Or, more to the point, why did this interest Detective Inspector Gray. Click on the book's cover art to read it's excerpt. Site © 2010 A.R. Grobbo. All Rights Reserved.